My husband and I were out at the summer house on the North Fork of Long Island last weekend, closing it up for winter (always a sad affair). The plan was to work all day, pulling in porch furniture, cleaning out the refrigerator and so forth, and then go out to our favorite local restaurant, Love Lane Kitchen in Mattituck, for dinner. I wasn't about to wear my housework grubs out to dinner, but I didn't want to fuss over what to wear either. So before we left our year-round home in the morning, I threw clean slacks, a top, and a long sweater into a bag. I love long sweaters at this time of year because they provide warmth without having to resort to a winter coat, which will be the only option in another month. Long sweaters also create a stylish, casual outfit without the fuss--you can throw them over a simple top and just about any narrow slacks, jeans or leggings. For styling, I like a long sweater and short boots with a heel, giving my 5'4" frame a little height. I've seen some over 40 women with great legs wear a long sweater with their pants or leggings tucked into tall boots. I also like a long scarf with a long sweater. Here's a couple of online long sweaters that look like great choices for this time of year. And if you have a knee-length or longer winter coat, you'll be able to wear long sweaters all winter. Is a long sweater a new look for you? There are many different styles, so I'm confident that you'll find a flattering one. I like my black one (above) because it's a little fitted on top and flares at the bottom. (I'm also a sucker for double-breasted anything.) 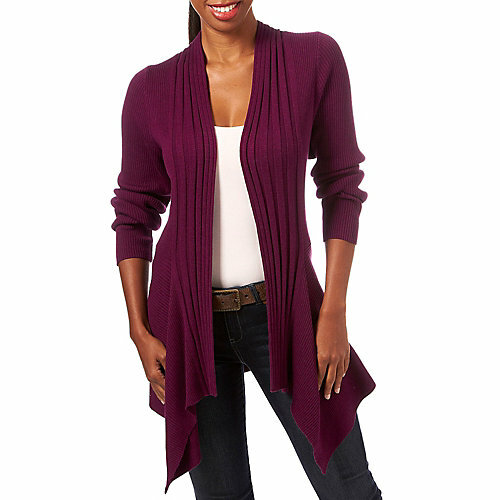 If you're trying a long sweater for the first time, you might want to start with a well-priced version like this Nue Options Solid Ribbed Cardigan ($48) from the Beall's online store.